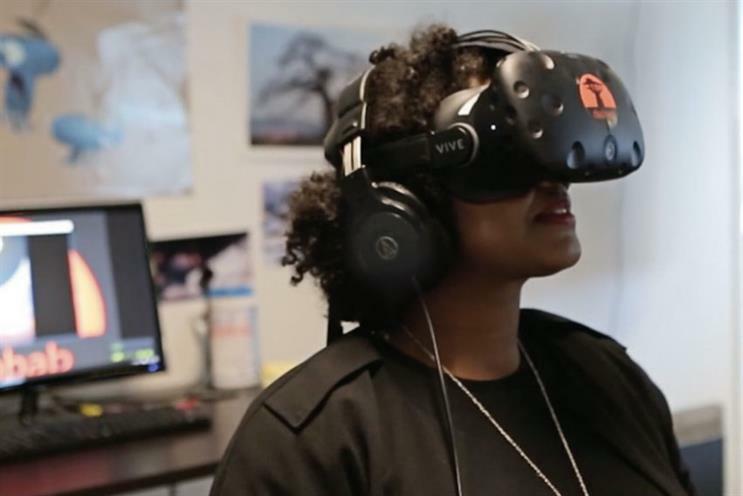 Tara Moore, Managing Editor of FutureVision, speaks with Maureen Fan, Baobab's CEO and Co-founder, about the emotive power of VR, its impact on branded storytelling, and what a VR ecosystem of the future might look like. Tara Moore experiences Baobab’s immersive fictional world in Invasion! firsthand. Dubbed the "Pixar of VR," Baobab Studios creates virtual reality animation experiences. In its debut episode of Invasion!, you, the viewer, play one of two cuddly bunnies greeting alien invaders. The award-winning film premiered at the 2016 Tribeca Film Festival. Tara Moore: So tell me about yourself. You always wanted to get into animation, right? Maureen Fan: Yeah, I’ve loved animation since I was young. My undergrad at Stanford was actually in computer science and psychology, because I wanted to do animation. Those are the disciplines I felt you needed to be a great animator.Iwas a UI designer at eBay, and I loved it. I mostly liked all the places I’d go because my animation teacher at Stanford taught me that no matter where you go, just do a good job, and it will help you. Like, she used to be in the circus! And somehow that helped her as an animator. While I was doing UI design, on nights and weekends I still worked on animation. I went to community college, because animators from Lucasfilm would teach there. I also took figure drawing classes there. After five years at eBay, I’d saved enough money that I could pursue my dream without my parents being worried. So I wanted to go to art school, but the deadlines had passed. The deadline for round three of business school was still available. My mom said, "You should apply for business school!" I applied, I got in, not thinking I would because it was round three, but I was like, "No, I’m not going, because I don’t like business and I want to do this film thing." So I quit my job and went to Hollywood, and I became the assistant to Zach Braff and Joseph Gordon-Levitt’s talent manager. TM: So you started as a UI designer; what brought you to Zynga? MF: I realized that at the end of the day, everything is a business.Iended up going to Harvard Business School, where I was elected to run the Entertainment and Media Club, and during that time I had an internship at Pixar, where I worked in production on Toy Story 3. From that experience I realized that, yes, I love animation and I love the people in animation, but from a business perspective, spending five years on a film without knowing whether it’s going to do well is not the best business model, especially if you don’t have the theme park division as a buffer. You’re not going to do well. So instead of going back to Pixar, I went to Zynga right after I graduated, and they had literally just started. It was a new business model, and I was really excited about that, because I wanted to be in entertainment, and at the same time I wanted to be part of a startup culture. I started as a senior PM and was there for six years, and ended up leaving as Vice President of games, looking over the FarmVille franchise as well as UIP. So I ended up owning 40% of the company’s revenue, and really learning about different business models and how to make content rational. Like, how do you spend less money and make it less risky? But nights and weekends, I still loved animation. So I ended up working on the short film The Dam Keeper, directed by two of my friends from Pixar, and I did production and PR. We were nominated for an Oscar last year. I just couldn’t not do animation. TM: So from eBay to gaming, to animated film production, and now to VR. What gives? MF: The first time I worked on VR, I did live action and I did not like it. I was underwhelmed with the low picture quality. Our standards for reality are very high. Looking at this headset with the pixels versus reality, I was just like, This doesn’t do it for me. But the first time my engineer hacked one of my VR games into their headset just for fun, I put it on and thought, I need to leave immediately. This is the future of animation. TM: Let’s back up: When you were talking about your education, you said you studied psychology, computer science, and art. What did you think psychology brought to the table, from an animation perspective? MF: Being an animator is all about being an actor. Usually you have actors, you know, De Niro, he does the acting. In the case of an animator, you have to be Nemo, you have to be Cinderella. You have to be that character, and you have to animate it the way you would act. So you actually do have to be an actor. It’s interesting, because for live action, you know, you can tell De Niro: "Do another take." But as an animator you are, in a way,acontrol freak. Because you are animating at 24 frames per second! Literally, you can pose the character—the arm goes here, the finger goes here—exactly the way you want it. So you really have to be in tune with What is this character thinking right now? What do we want it to convey? And then make it exactly like that. So that’s where psychology is very important. How good of an actor can you be? How can you get into the mind of the character? So psychology was definitely helpful. As a UI designer at eBay, I was a user experience researcher, or cultural anthropologist. My job was actually to go to different countries and study culture like an anthropologist, and understand how we should enter that market. The first thing they teach you in cognitive psychology is don’t trust what anybody says, watch their behavior. It makes me kind of neurotic, though, and a terrible girlfriend. When researching markets, I watched people’s body language, what they’re doing, and then learned and interpreted from that how they really feel and what they really mean, which is all animation—their facial expressions and what they’re conveying through their bodies—more than anything else. So it was actually really great training for me. As for how I fell in love with VR, it was literally that. The game was not even animated. When my engineer tapped in on the environment, just the scene, in the VR headset—and at the time it wasn’t mobile, it was like your VR data prototype—I was transported to another world that didn’t even have anything moving around in it. But it was enough, because for animation you truly believe you are there. There’s suspension of disbelief. Something happens when I watch an animation. For the 90 minutes that I am watching an animated film, I can believe that that fantastical world is real. When hundreds of people worked on it, but it feels like only one person has worked on it because there’s one director, and it feels so real, I believe that anything is possible. That world is real, those characters are real, and I can do whateverIwant! There’s so much potential! I leave an animated film feeling like I need to go after my dreams. I want everyone in the world to feel that when they are watching animation. Animation is art in motion, and it takes you to completely different worlds and makes you believe they are so real that you can reach out and touch them—and that is the definition of VR! So VR is amazing because it can do that even better than a rectangular screen can. Storytelling is all about making you feel emotions, and making you care about that character. You want to see what happens to that character next. You get to a point where you’re worked up with anticipation because you want to know, Is that character going to let me down? Is that character going to get what she wants? That ability to get you to feel something so intensely is amazing, and in VR we’ve found with Invasion! that people say, especially when the bunny is behind them, "I feel like I need to protect her! I am the only thing between that alien and that bunny, and she played with me, and I love her andIneed to protect her." That means they care about her more than they would in a rectangular screen, and at that point, that is realizing the potential of storytelling and VR, to get you to feel even more than you would otherwise. We are only scratching the surface, we are only on the first film, but we are really excited about exploring that even more! It’s our holy grail: How do you get the audience to care even more? TM: So you’re already touching on the gap VR fills in the entertainment space: It puts you at the heart of the story. What are the implications for the ways marketers tell stories, or the ways brands tell their stories? MF: So many filmmakers prefer to make you the ghost head, just the same way that you would be in the theater, where you are an observer, not a character. What we really want to experiment with is what happens if you are a character. In Invasion!, you have a bunny body. When you look down, you see you’re a bunny, and if you squat, your bunny body gets fatter. Kids especially love to run around the room hopping like a little bunny. Half the time they just stare at their bunny body, and they want to watch the film a second time to see the story. That experience is something unique that we can do with VR that we couldn’t do otherwise. There’s a lot of VR right now that feels like tech demos. It’s technology first, and it drags the story along with it because there’s such excitement about the technology. We believe that when the novelty of the tech eventually wears off, it’s still going to be the story and the characters that matter most, as they have for every single entertainment medium. So for us it’s always story first, and then the technology is there to help us tell the story in a different, unique way. Every single medium (books, plays, films) has its own benefits and its own special thing that it does better than anything else. VR is yet another toolbox, another medium for telling stories. At the same time, the heart of the story is the most important, and the story can be told in different mediums. Just as The Lord of the Rings was a great novel, it was also a great movie, right? So the novelty of the tech doesn’t mean that content made for VR is only made for this one medium. Ultimately, it just proves that the storytelling is the first and the most important part. That’s what we’re really focused on. If you can’t tell a story verbally, then it’s not going to be good in VR either. The story is where it all starts. For brands, there’s little competition right now for eyeballs in VR. There’s not that much stuff to see. So if you’re able to get your brand there, you have a disproportionate number of views. So it makes sense that brands really are excited about this medium. The difficulty for brands is there are so few people who can create good VR right now—so few who have access to the tools and the mindset to create it. Trying to figure out who are the right people to partner with is quite difficult. The other advantage that brands have in VR is a captive audience, because you can’t switch to another channel and you can’t multitask with another screen. An audience member or viewer is completely immersed in that branded world. Everywhere they look, they are inside the brand’s world.